Discus Music is now pleased to make available the new Mick Beck documentary DVD which premiered at a full Showroom Cinema 5 last January! Mick is one of the world's best virtuoso tenor sax and bassoon players. He began free improvising in the hotbed of 1980's London jazz scene, citing Sonny Rollins and Eric Dolphy as his main influences in the genre. Moving to Sheffield in the 1990's he met and played with Derek Bailey and through to 2004 was one of the lead organisers of Sheffield's Other Music, a bastion of the UK 's free music scene for 22 years. In this revealing documentary Mick is interviewed about his personal and public musical life, from childhood to present day. The film includes much live footage, recordings and photographs from the last few years, demonstrating truly exceptional diversity. New interviews with a number of Mick's contemporaries in Sheffield bolster the view that Mick is at the centre of the dynamic powerhouse of spontaneous composing. The film is a fast paced and fun yet deeply revealing foray into a most misunderstood form of creative expression, known as free music. This DVD contains material right up to 2013. 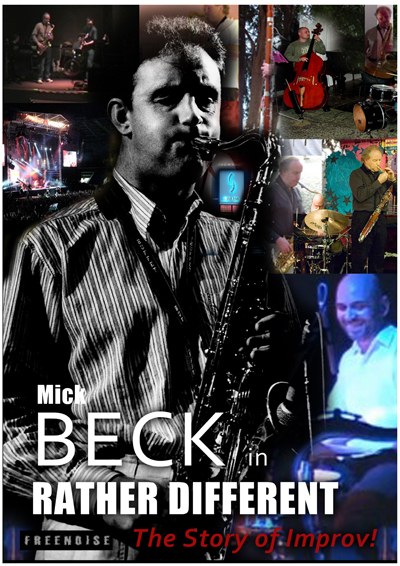 Mick Beck’s incredible musical output goes from strength to strength! Life Echoes CD - 3 tracks!